I spent 7 days here and I feel like I just skimmed the surface of an amazing country! I was traveling from India and one thing that instantly got me was how much more setup the country is. At the airport we got picked up in a Hybrid Toyota Prius and straight down a 4 lane highway. I was able to get a Sim Card for 500 Sri Lankan Rupees with 5 GB of Data for 20 days. The visa process was great as well , I recommend getting an ESTA before hand ( but you can get these on the day ) and you will need to fill out a landing card on Arrival which they don’t tell you until you have got the front of the line…. People arriving from India, there is actually nowhere to change these in the airport. This is due to the currency being a closed currency and currency places in the airports are banks, however, as always there are people around to do this. I actually found this VERY easy , I was able do to this in a Food shop in Kandy for a good rate however ask around the place you are staying. There is an ATM at the airport. I arrived in Colombo , my original plan was to spent the night in Kandy and take the train from there , however as I arrived on the weekend they said the trains where not running that often. The Colombo to Kandy train is not that scenenic however train travel on the weekend is very busy! I choose to stay in Colombo for the night and depart at the 5.50 the next morning. I had no bookings so the earlier the less busy I thought! I turned up at 5am and was able to book a first class ticket to Kandy , a 2 hour layover then continue on the journey to Ella. First class enabled me to get a reserved seat in air conditioning , you can get Second Class Reserved however you cannot purchase this on the day , you need to pre purchase. As Colmobo is at the start of the track , an instructor will come around and reverse the position of the seats to face the other way. You can buy food and water before boarding the train at many places allong the track, however don’t worry there will be a continuous offer of refreshments throughout the journey from the onboard kitchen, Sweet Chai Tea being my favourite! The train moves at a slow pace which means you can hang your leg, body out of the door which have given reason to everyone wanting to get the famous instagram shot. Their is usually a queue for the open door due to this! The train takes around 4 hours and is breathtaking! As I had a simcard I was able to book my accommodation on the train. I choose Ella Escapade Hostel which I can’t recommend enough , there was only one bed left so I recommend booking this as early as possible! 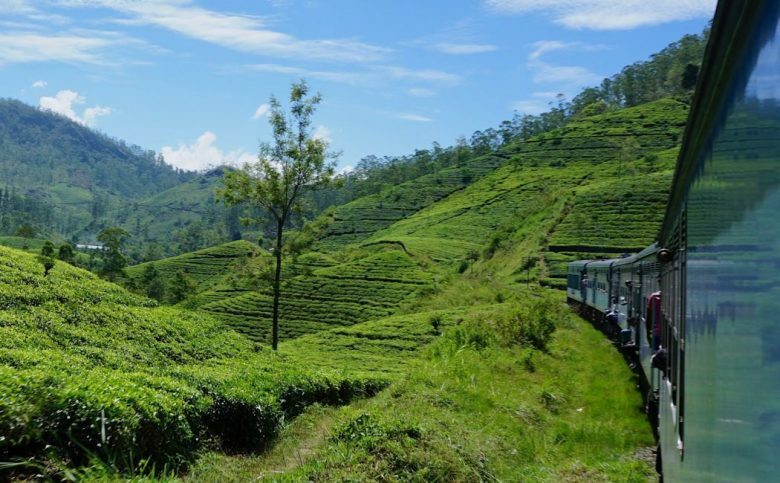 Ella is famous for its Tea Fields , hiking and generally a cool backpacker hangout. Next stop was down the coast. The cheapest way to do this is via local bus. Its an experience in itself , no aircon, sometimes no seats , however for 360 Rupees for a 4 hour journey its a bargain. You can pick this up at Ella Bus Station. I recommend picking up some refreshments before the ride especially water , however there will be again offers throughout the journey at different stops. Next stop was the Dutch Fort of Galle. A nice A big city on the coast, which has great western food inside the fort if you are missing out on a steak or sushi! I actually found the city outside the fort had great street food as well. There was actually some good surfing here for beginners. If the conditions are good take a board out, as you don’t know when the conditions will drop. To me this city was very resort-y! It was definitely relaxing , I never saw more than 100 People on the beach and was offered items for sale twice ! I’d say this was a good place to come and relax and obviously why my friend had chosen it for the destination for his wedding! Street Food – A big love of mine in asia is street food. I’m a one for taking chances so usually try one of everything. Sri Lanka has multiple variance of food type per city so I recommend you get to the city and watch out of these. Local Food – I really like going deep and local with food and I also like spicy food so this actually goes hand in hand in Sri Lanka. My tip to find local food was to watch were the tuk tuks were going for Lunch. There will be lots of snacks on offer at the front of these places usually Samosa’s or Rotti filled treats which you can take away. If you opt for the sit-down option this will be a buffet selection of curries with Rice/Noddles where you pick your choice and pay later. Sri Lankans like Indians use their hands to eat Curries which you can partake in ( Good instructions ) or ask for a spoon! The flavours are amazing and it will set you back 150-250 Rupees for a very filling delicous meal. For people who do not like spice I’d make sure you know what your ordering!